The Central Permitting Department is a centralized location that enables the consolidation of permitting for Building Inspections, Planning & Zoning, and The Environmental Health Department. Central Permitting enables citizens to apply for and obtain all required permits more quickly and conveniently being in a one stop location. Applications for Building, Electrical, Mechanical, Plumbing, gas-Piping, and Mobile Home set up trades may be down loaded, signed, and returned to The Central Permitting Department along with applicable fees. All fees can be paid by check, cash, debit, or credit. Checks should be made out to Stanly County. Applicant is welcome to call Central Permitting at 704-986-3667, 704-986-3675, or 704-986-3660 to inquire of fee amount when necessary. Signed and completed applications may be mailed to: Central Permitting 1000 N 1st Street Albemarle, NC 28001 Suite 13 with a check, or they can be faxed or e-mailed and payment can be made with a credit card. After any permit is issued, a request for inspection can be made by calling Central Permitting. Request made by 3pm will be placed on the next day schedule. After 3pm request will be 2 days out. Contractors can request inspections online if they have signed up with BluePrince (our automated software system), and can view their inspection results. When calling please always reference a permit number or address, and leave instructions about key or other entry information. 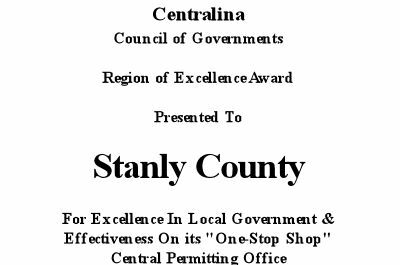 Stanly County Building Codes Enforcement jurisdiction is all of Stanly County. The Permitting Office is required by General Statutes to collect a $10.00 homeowner recovery fee from each licensed General Contractor for each building permit issued pertaining to a single family dwelling. Then $9.00 of each fee collected is sent to the General Contractors Licensing Board, and the County retains $1.00 of the fee. The General Statutes requires Permit offices to have contractors fill out an affidavit for proof of worker’s compensation for projects $30,000 or more.